Charting the Course: Yield Curve Inversion – Predicting Recession? 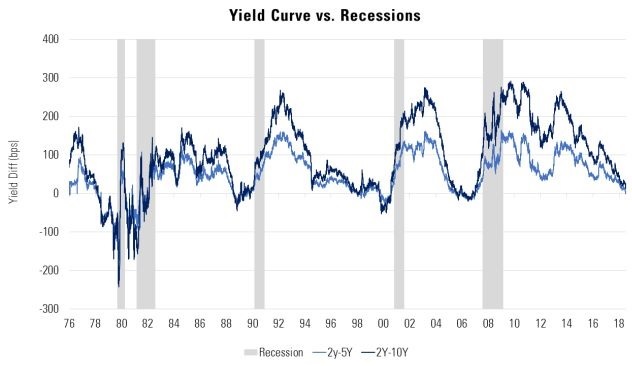 In the financial markets, no indicator of an economic recession is as indicative of possible recession as the slope of the yield curve crossing into negative territory. The first week of trading in December saw the much-awaited inversion of the yield curve, with the 5-year Treasury yield trading below the 2-year yield for the first time since June 2007. Another commonly cited yield curve measure, the spread between the 10-year and 2-year, has not yet moved into negative territory, but typically follows the 5-year and 2-year spread into inversion territory. Historically, the yield curve has proved to be an accurate indicator of economic recessions. In the 1980s, early 1990s, early 2000s, and at the dawn of the Global Financial Crisis in 2006, the yield curve inverted in advance of a recession. Redmount Capital Partners, LLC (Redmount) provides financial guidance and makes recommendations based on the specific needs and circumstances of each client. Investing involves risk and clients should carefully consider their own investment objectives and never rely on any single chart, graph or marketing piece to make decisions. The information contained in this blog is intended for information only, is not a recommendation, and should not be considered investment advice. Please contact your financial adviser with questions about your specific needs and circumstances. This blog is a sponsored blog created or supported by Redmount and its employees, organization or group of organizations. This blog does not accept any form of advertising, sponsorship, or paid insertions. Certain authors of our blog posts may be influenced by their background, occupation, religion, political affiliation or experience. It is important to note that the views and opinions expressed on this blog are that of the owner, and not necessarily Redmount. As a Registered Investment Adviser, Redmount does not allow any testimonials on their blog, and any comments deemed as such Redmount will remove. Redmount does not offer tax or legal advice; therefore all articles should not be taken as such. Please consult legal or tax professionals for specific information regarding your individual situation. All referenced entities in this site are separate and unrelated to Redmount. Any references to any specific commercial product, process, or service, or the use of any trade, firm or corporation name is for the information and convenience of the public, and does not constitute endorsement, recommendation, or favoring by Redmount. ← Reuters. Redmount Capital Partners’ chief investment officer Vincent Catalano CFA tells Reuters’ Fred Katayama why he think the markets are on the cusp of turning from a bull market into a cyclical bear market.